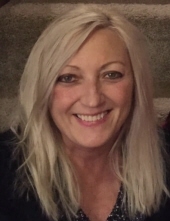 Sallie Chaundy Hudspeth of Macomb Township, Michigan passed away in the early morning hours on Wednesday, March 27th after a long fight with congestive heart failure. She was fifty-nine. Born in Detroit, Michigan on December 23, 1959 to Kenneth and Mary Ann Chaundy, Sallie was the youngest of four children and is preceded in death by her oldest brother, Dennis. She is survived by her sister, Carole, and her brother, Frederick. Sallie is survived by her husband, Clay. They married on May 5th, 1991, almost twenty-eight years ago. In Clay, she found a soul mate by whom she was deeply loved and with whom she could share her many interests. Sallie is also survived by her three children: son Jamie, daughter Chelsea, and son Chase - her sun, star and moon. Her children were her life and she was always encouraging them, guiding them to do their best, and - above all - to be happy. She lives on in them, in the choices they will make and in the things they hold dear. She embodied the phrase "pure Michigan." Her favorite place throughout her life was Houghton Lake, which she called her "happy place." It was where she went to recharge and restore, immersing herself in her love of nature and the surrounding water. She was an outdoor woman. Sallie shared that love and passion with many and we were all so profoundly affected by her generosity and laughter. Everyone enjoyed the cottage with her, making life-long memories. Sallie is a true example of a life well lived, one that was driven by the values of spirituality, selflessness and family. She had the family she was born into, the family she made, and the family that she created with friends. She is a true Earth Mother and is survived by her many friends; a sampling of humanity which is as varied as her interests in life. Sallie was a valiant, brave soul who always fought for what she believed in, including her life. She can rest now and know that she did very well, very well indeed. To send flowers or a remembrance gift to the family of Sallie Sue Hudspeth, please visit our Tribute Store. "Email Address" would like to share the life celebration of Sallie Sue Hudspeth. Click on the "link" to go to share a favorite memory or leave a condolence message for the family.